Sometimes no matter how hard you plan it is unavoidable that life gets in the way of running. For me last Sunday was the most recent time but this time life got in the way of Triathlon instead. I was looking forward to my race last Sunday, Reverse Enduro format triathlon which is a lot of fun. Enduro means you do all three legs twice and this time the normal order of triathlon is reversed. So Run, Bike, Swim x 2.This type of format suits both strong runners and strong swimmers. For the runners it’s a great benefit to run first and get a lead on the swimmers or cyclists. I was looking forward to not have to push harder than I’d like in the swim and bike to stay in contention and then try and blaze the run. Much easier to push hard on the run first and try and hold on during the bike and swim and with endure do that twice. Saturday night I got my gear ready, checked over my bike and packed the car ready to get up early in the morning and get to the race. Kids asleep, set the alarm and off to sleep. My alarm went off at 5am and I woke up to get ready to race, then something unusual happened, my partner woke up at this time of day and came out to see me, I instantly knew something was wrong when I saw her as she looked terrible, she told me she didn’t feel well. She’d woke up with an acutely sore throat and a bad head cold. I couldn’t go racing now, she needed me so I spent the rest of the morning and day looking after her and our two kids while she rested. Sometimes life just doesn’t let you run, or do triathlons and this was an occasion for me. I knew instantly when I saw her that morning that I wouldn’t be racing and that something was wrong. I felt bad for being disappointed not to race, but after all your partner is much more important than a small triathlon and I had no choice. Not that I minded looking after her and I had a fun day looking after the kids, but I was looking forward to racing. Anyway it wasn’t the Olympics, I don’t have to wait four years for another race. I got back to racing tonight at my local trail running clubs weekly race. Only a 5km trail race but good fun with a great bunch of people. 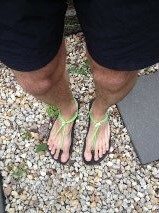 I wore my Gladsoles sandals for the first time in a race and they were excellent. Lot of steep short up and downhill on this course and they handled it great, fantastic grip and ground feel on the dirt. My partner is feeling much better now so life didn’t get in the way today and I managed to get the win today. Let me know if life’s ever got in the way of a race you were looking forward to? This entry was posted in Running and tagged Barefoot Running., barefoot sandals, running, triathlon. Bookmark the permalink. Life has got in the way of a few races, and by life I mostly mean work. Great post and observation about life getting in the way of running! This happens fairly regularly in life at the moment, as my wife and I have three young children. You’re spot on in how you dealt with it though, and it is only natural as a competitive athlete that you’d be a bit disappointed you couldn’t compete. Hope your next event goes ahead for you!